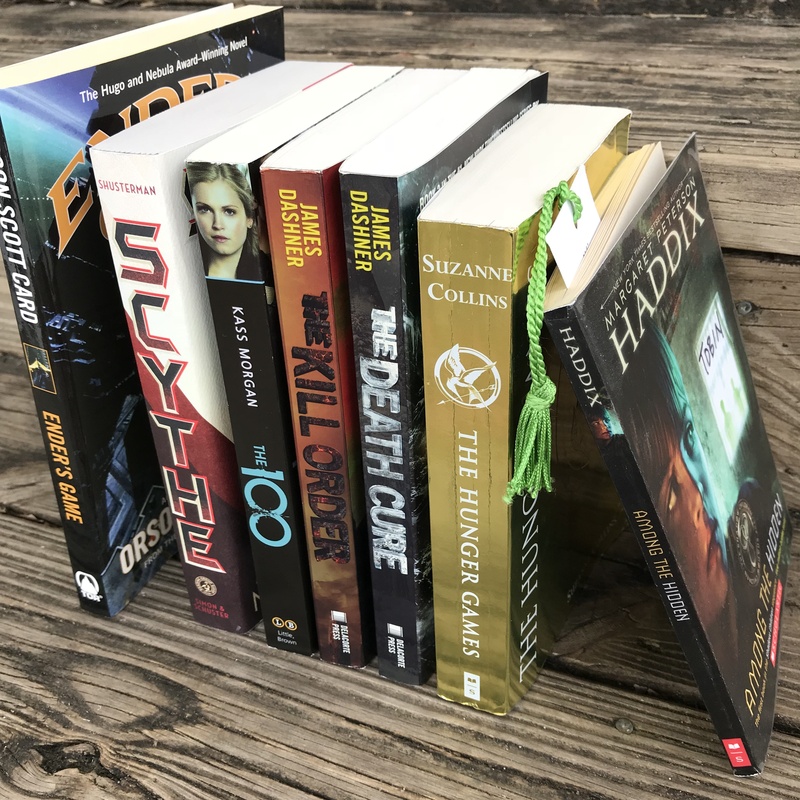 Dystopian genre books comprise the bulk of Mr. Star Wars’ 8th grade book stack (check out my other BLOG POST about middle school boy books). 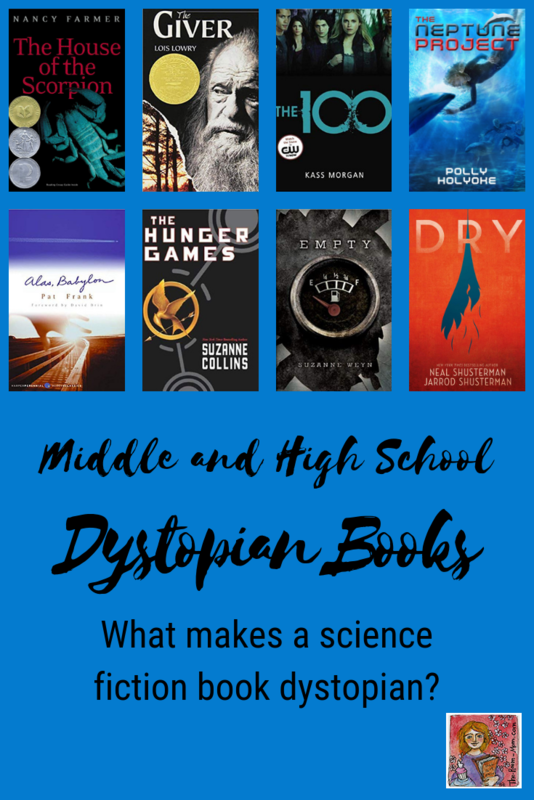 Dystopian books are a sub category of science fiction and are a favorite YA book genre. Science fiction books are generally geared to middle and high school students because the content is heavier. Themes and common story lines in science fiction stories deal with apocalyptic events, death, disease, dying, wars and typically have a dark tone. In dystopian books, the protagonist or main character faces a big challenge that will possibly save the world, and he/she uses various skills and cunning to make that happen. I believe this is the appeal of the dystopian book. A character who is the same age as the reader takes on an important cause and succeeds in some way. It gives the reader a sense of empowerment. How do you know a book is science fiction? The story answers a “what if” question. What if we could time travel? What if we lived on Mars? What if the temperatures on Earth rise significantly? The story incorporates the impact of scientific or technological changes on people. The setting is in the future or alternate universe. How do you know a science fiction book is dystopian? Many middle school classrooms will include a dystopian book as part of the reading curriculum this school year. Use THIS ACTIVITY PAGE to identify general science fiction characteristics in books, dystopian characteristics, and then compare to a specific book. I just finished reading Wendy Mass’ latest book, Pi in the Sky. I have not decided if I like the book or not. Some parts confused me, but other parts about beings who oversee our universe and are responsible for keeping the planets in orbit kept me reading. There is a space/time element in the book as well. I started thinking about books I have read where characters travel through time to a different reality, and the character’s world is still running in a parallel universe, so the space-time continuum is disrupted. I kind of like the circular thinking of a person returning to the past, disrupting an event that occurred, and then meeting up again in present day a la Back to the Future. It has the ability to blow your mind if you really concentrate on the whole concept of time. Here are a few book choices that deal with dropping in and out of time. Charlotte Sometimes by Penelope Farmer– This is for a more sophisticated reader. The language and vocabulary is more difficult, and the story pace can be slow. I like this book, though. Children of the Red King, Charlie Bone and the Time Twister by Jenny Nimmo– Many people list this as a Harry Potter read-alike. This book is the second in the series. The Devil’s Arithmetic by Jane Yolen– Holocaust alert! George Washington’s Socks by Elvira Woodruff– If you are a fan of Magic Treehouse. This is like a Magic Treehouse for an older reader. Woodruff has companion books too. The Gideon Trilogy, The Time Travelers by Linda Buckley-Archer– I loved the first book; I could not finish the sequel. The Magic Half by Annie Barrows– My favorite time travel book. North of Nowhere by Liz Kessler– Found this because I love the author’s Emily Windsnap series so much. Teddy Powers: The Stone Keepers by Anne Todd– This is a self-published book by a parent at my school. My students (and Mr. Star Wars) love this book. It is available on Amazon. The 13th Reality, The Journal of Curious Letters by James Dashner– This book can be slow in parts, but the concept of parallel lives existing at the same time held my interest. The Wells Bequest: A Companion to the Grimm Legacy by Polly Shulman– I really liked the Grimm Legacy, so you may want to read both books. When You Reach Me by Rebecca Stead– This book is so much better if you are familiar with A Wrinkle in Time. A Wrinkle in Time by Madeleine L’Engle– One of the originals for this type of science fiction (in my opinion). I am trying to remember the name of a book I read as a child about a character who would walk down a foggy street and be transported back in time. I think the setting of the story was London. Does this sound familiar to anyone? Please help me out with a title if you read this book too!